After a lengthy cold stretch that made some of us wonder if spring would ever arrive (recall the Winter Weather Advisories on the first day of spring last week? ), a massive trough responsible for the cold air is finally lifting east. This is allowing for more of a progressive weather pattern to develop, which means frontal systems passing through but better chances of warmer weather! That process started yesterday with temps warming into the upper 60s (which felt pretty darn good!) and continues today as a stationary front and upper level disturbance combine to bring showers during the mid-day hours. That front will shift just to our south by tonight with wind shifting to the east and mainly dry weather for the end of today and tonight. However, the front will once again lift north tomorrow as another disturbance moves through, bringing another round of showers and possibly an isolated thunderstorm during the daytime hours. For those planning Easter Egg Hunts or other outdoor activities Saturday, we strongly recommend a plan B, just in case. Timing of these "waves" of precipitation is not an exact science! As we head into Saturday night, the front will once again make a last run south, bringing another good chance of rain and possible thunderstorms Saturday night into early Easter Sunday. Those with outdoor Easter sunrise services also need to have alternate arrangements. However, during the day Sunday, we expect the front to have "washed out" to our south and some sun to break out. This should push temperatures up to near 70, if not slightly above, Sunday afternoon. We're crossing our fingers for a decent end to Easter Sunday and maybe good egg hunting weather in the afternoon, despite wet ground! Fortunately no severe weather is anticipated this weekend. Finally, late Monday or Monday night, another cold front (this one with much cooler air) moves through the Mid-South. Another chance of rain or thunderstorms accompanies it, followed by cool (non-springlike) temps for the middle of next week. Once again, we'll see highs in the 50s and lows in the 30s. Hopefully this cool spell doesn't last as long as the past one! That is doubtful as we head into April when average highs reach above 70. The complete MWN Forecast can be found here. 5-day rainfall projections indicate 1-2" of rain is possible through the holiday weekend and into early next week. On a final note, we are saddened to let you know that this Sunday will be social media intern & nowcaster Hunter Smith's final day with MWN! Hunter (/HS on our social feeds) has been a great addition the past 8 months and we are grateful for his dedication and service to us and all of you! Hunter graduated from the University of Memphis in December and has plans to attend graduate school in Meteorology. We wish him all the best! A quick update to yesterday's blog on the potential for snow today... the second day of spring! The Winter Storm Watch has been replaced with a Winter Weather Advisory for the west TN counties in the metro (including Memphis and Shelby County) and Crittenden Co (as well as others) in northeast AR - see map below. Areas in north MS are expected to get less than an inch of snow, if much at all, thus no advisory. The Advisory is in effect from 7pm tonight to 9am Friday, though as you'll read below, any snow will have changed to rain long before that. 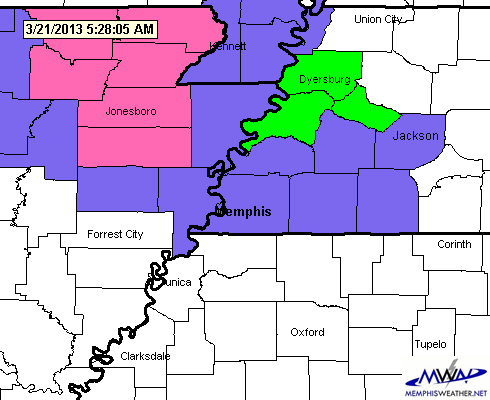 Winter Weather Advisory for purplish-shaded counties. Winter Storm Warning in pink. Overnight mode data suggests that the threat of accumulating snow is diminishing, mainly due to a possibly later onset. In this scenario, warmer temperatures (especially in the 1-3,000' foot layer) are moving in as you go through the evening hours, which means if the precipitation starts later, there is a better chance it will be more rain than snow. We now expect very light precipitation (mainly sprinkles with possible light sleet or flurries) will be possible after 4pm, but the main area of precipitation may be delayed until as late as 6-9pm. By midnight, precipitation should be all rain. Therefore, there is a narrow potential window this evening from 6pm-midnight or so when rain can, and likely will, mix with snow. In Memphis/Shelby County and Fayette County, the rain/snow mix could produce a half-inch to inch or so of snow - mainly on grassy or elevated surfaces. In Tipton and northern Crittenden County, the total could be 1-2", though an inch seems more plausible. Overnight, rain will fall, which should help a great deal in melting any snow. This is certainly better news for those who were dreading a mid-March snow, but bad news for those who wanted one chance to get the cardboard sleds out! We'll continue to monitor and bring you the latest - follow us on social media at the links below. Naturally, since today is the first day of spring, we should be watching highways getting brined and meteorologists pouring over model data looking at precipitation timing and critical temperature thresholds right?? In the crazy world of weather, saying "it's not going to happen" is a taunt to Mother Nature, who may decide to hit you with a snowball of humility. 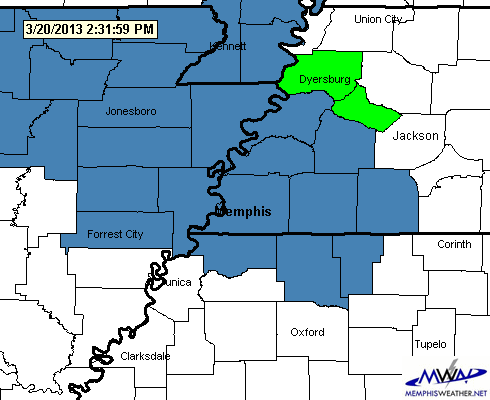 Alas, a Winter Storm Watch has been issued by the National Weather Service for the entire metro, except Tunica and Tate counties, valid from 1pm Thursday until 7am Friday (see map below). No this is not a joke and April Fool's is not here (but it's not that far off!). Computer models have been having a tough time with this system, which is an upper level disturbance (albeit a potent one) in a pattern called "northwest flow" (which means jet stream-level winds are blowing from the northwest over our area). However, today the models, while still disagreeing somewhat on amounts and exact placement, are more in agreement on the occurrence of winter weather. The main placement issue is in the eastern and southern extent of accumulating snow - which happens to be over the metro! Below are the morning instances of the GFS and NAM computer models showing expected snowfall accumulations. We use other models as well, but these are the most referred to in the short-term (3 days or less) and show the general pattern fairly well. I have purposefully hidden the legends on these maps to not show the exact amounts they are forecasting, as neither is probably right just yet on how much we'll see. They are used for reference on where the potential for more snow is, which happens to be across the northern sections of the metro (northern Crittenden, northern Shelby, Tipton, and possibly Fayette). What time? light precipitation will start in the metro after lunch Thursday, more likely closer to 3pm and intensify by rush hour into the early evening, with light precipitation continuing overnight and into Friday. What type? Precip should start off as light rain, maybe with some sleet mixed in as the air saturates and cools. As temps fall from near 40 at lunchtime into the mid 30s during the afternoon, we'll change to rain/snow, then likely to all snow by rush hour into the evening. After 9-10pm, any wintry precip should change back to rain. How much? The million dollar question and hardest to answer. We are forecasting less than an inch in the southern metro (north MS), an inch or two along the I-40/Hwy 64 corridor, including Memphis and Shelby County and Fayette Co, and 2-3" for northern Crittenden Co into Tipton Co. This is less than what the NWS is calling for but their Winter Storm Watch is for a much larger area that could see more snow and a longer impact. Our forecast is specifically for the 8-county Memphis metro. After snow changes to rain during the evening hours, rain (mostly light) will continue overnight and it appears we could have a wet Friday and Saturday, at least lengthy periods of both days/nights. Temperatures tonight in the 20s and dewpoints in the teens with clouds arriving tomorrow morning could keep temperatures cooler than forecast on Thursday, which could affect snow amounts. This is still a big question mark. We'll continue to monitor. Forecasting snow in Memphis in MARCH is about as tricky a forecast as they come. We do our best to take a shot at it, leave the hype to others, and will gladly eat crow if we miss! Follow us on Facebook and Twitter (links below) for the latest information as we head into what HOPEFULLY is our last gasp of winter for 2012-2013! However, don't be surprised when we stay cool well into next week and also expect that we will see some thunderstorms early Sunday as this whole system finally kicks out. The complete forecast can be found here or on our mobile apps. Warm spring days to end the week have given way to a frontal boundary that has draped itself across the Memphis metro today. 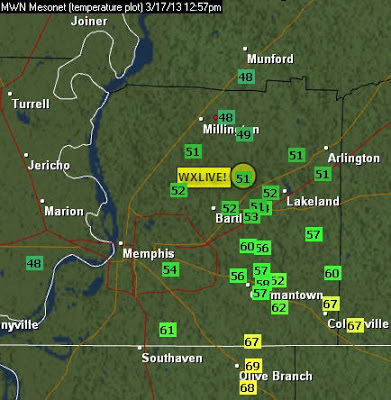 While northern areas of the metro (Tipton County) are still sitting in the 40s at 2pm, north MS is nearing 70 degrees! Low pressure over the southern Plains will move just north of the front across AR and into the Ohio Valley by tonight. As it does, the stationary front will lift north as a warm front and a cold front will move towards the region from the west. As the stationary/warm front lifts north, more unstable and warm air will also move north, placing the metro in the "warm sector" of the approaching low pressure system. Green line = stationary front draped over the metro at 1pm. 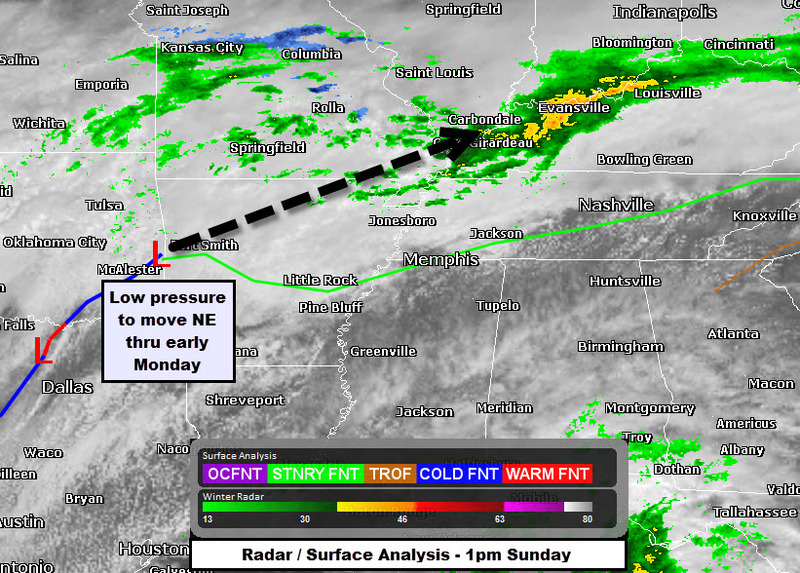 Low pressure to the west will move NE, lifting the front north and bringing a cold front into the region late tonight. With the low moving in close proximity to the region and warm and moist air just to our south, the Mid-South will be in a corridor for potential severe weather. The stationary front will start lifting north this afternoon. As the sun sets, instability tends to wane - so we have a dilemma regarding the magnitude of the unstable air, which will have a direct effect on the strength of any storms. It does appear that storms will be likely, however, and there is a risk of a few severe storms south of the path of the low, in the warm sector, and ahead of the approaching cold front. The area delineated by the Storm Prediction Center is the Slight Risk area (shown below) , or that zone where the possibility of strong to severe storms is enhanced. It includes the Memphis and Little Rock metro areas down to Texarkana and north to far western KY. 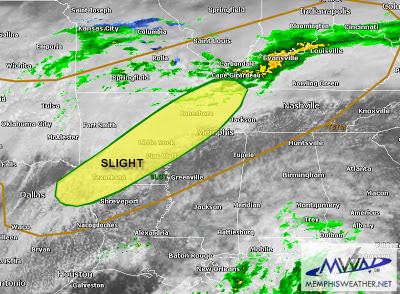 Slight Risk area as defined by the Storm Prediction Center. This area has an enhanced risk of severe weather. The most likely time for thunderstorms in the metro will be during the overnight hours, or after 10pm until about 4-6am (which doesn't technically make most of these storms St. Patrick's Day storms I guess). The cold front will arrive around dawn on Monday with the strongest storms in the hours leading up to that. Therefore, scattered strong storms are possible after 10pm, but more likely time for storms (with a few being severe) will be after midnight through dawn. The overall risk appears to be conditional - meaning that if certain atmospheric conditions are not met (namely sufficient instability), severe weather is not a given. As for threats in the local area from any severe storms, there is a 15% chance of large hail (1" or larger), about a 10% chance of damaging wind (60 mph or greater), and less than a 5% risk of a tornado. So, while hail and strong wind are possible in the stronger storms, an isolated tornado cannot be ruled out. (Top to bottom) Large hail, damaging wind, and tornado risk maps from SPC. MemphisWeather.net encourages you to have fresh batteries in your NOAA Weather Radio and your cellphone charged BEFORE you head to bed tonight as preparation for possible severe weather. For those with iPhones or Android devices, now is a great time to download the MemphisWeather.net mobile app (mobile link) and sign up for our StormWatch+ severe weather alerts on the Alerts tab in-app. StormWatch+ will wake you up if severe weather is imminent - but only if it's imminent at YOUR LOCATION (or any location you register). While NOAA Weather Radio alerts by county, StormWatch+ alerts are sent for your house! You don't necessarily need to be woken up for a storm 20 miles away on the other side of the county, but you should if it's bearing down on you. We will effort to provide complete overnight coverage of this event on our Facebook and Twitter feeds listed below. Our nowcasting is our bread-and-butter product - and it's free. Tell your friends and stay safe! UPDATE - March 13: I got a chance to see PanSTARRS last night and have updated the viewing tips accordingly. I could not see it without binoculars, but with them I could make it out once I knew where to look. This was in a subdivision with street lights, but it helped to move away from the lights a bit. 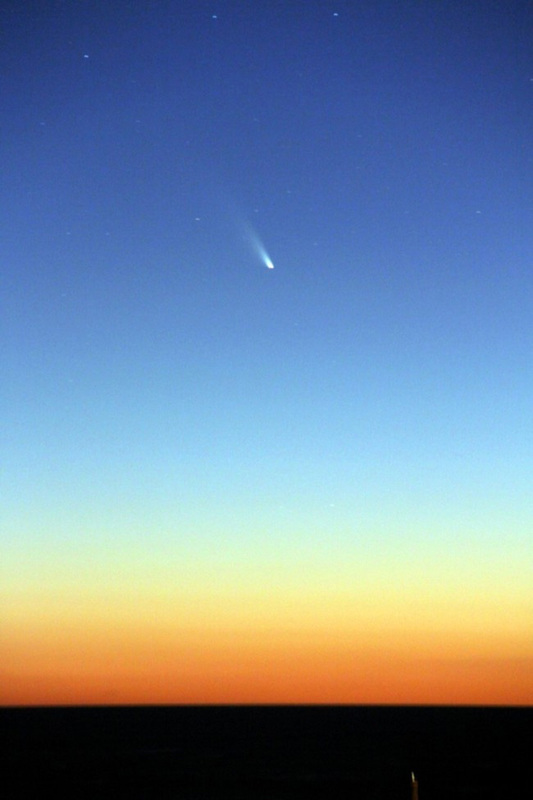 The comet is rather "fuzzy" when you spot it, but there is a definite "head" on the lower end of it with the tail extending up. It is not a shooting star, so you won't actually see it move. Tonight, find the crescent moon around 7:30-7:45, then look below the moon about the width of your fist when held at arm's length. Good luck! Until yesterday, I hadn't really mentioned the viewing opportunities for comet PanSTARRS (C/2011 L4) as we've had so much cloud cover it wasn't worth it. However - that changes the next few days! The only fly in the ointment appears to be tonight with a few high clouds possible this evening, especially if you're viewing from north MS, but we'll cross our fingers! When: 30-45 minutes after sunset is best. Sunset is at 7:05pm, so roughly 7:30-7:45pm. Where to look: Very low in the western sky. Get away from buildings, trees, and hills that obstruct a view of the horizon. Visual guides: March 12 - look just to the left of the crescent moon. March 13 - below the crescent moon, by about the width of your fist when held at arm's length. March 14 - about 2 fists below and slightly right of the moon. What to look for: see the pic above. It'll be head-down with a tail trailing. Can I see it without visual aids? Binoculars or even a telescope are highly recommended. Time-lapse photography with the proper settings will also likely capture it. 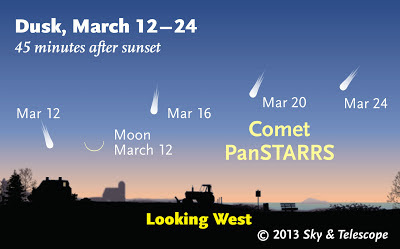 More information on the comet sighting can be found in this Sky and Telescope article or check out SpaceWeather.com. 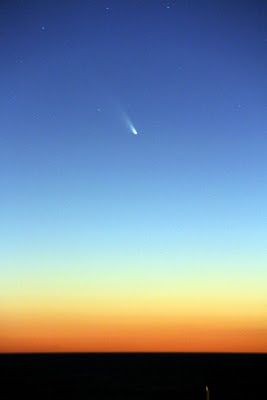 This will be the only viewing for this comet EVER due to it's orbit taking it into deep space. If you happen to see it, let us know on our social media channels below. You can also follow those for the latest forecast conditions for this week's viewing opportunities. Temperatures averaged very near normal, while precipitation was below normal for February. On February 18th, a squall line produced strong thunderstorms, but no severe weather in the city despite a few Severe Thunderstorm Warnings. Icing created hazardous driving conditions on bridges and overpasses on February 2nd while a light wintry mix fell on the 20th-21st. The average temperature for the month of February was 45.2 degrees, or 0.2 degrees below normal. The average high temperature was 53.5 degrees and the average low was 37.0. The coolest temperature of the month was 22 degrees on the 1st, while the highest temperature was 68 degrees on the 7th. There were 8 days on which the low temperature fell to freezing or below and no temperature records tied or broken for the month. Precipitation for the month totaled 3.85", which was 0.54" below average. There were 11 calendar days with measurable rainfall; 4 recorded totals of 0.5" or more, but none more than 1" (maximum 0.95" on the 18th). Snowfall totaled a trace on February 21st. The peak wind gust was 38 mph from the east on the 10th with an average wind speed for the month of 8.5 mph. Click here for a daily statistical recap for Memphis International Airport. The average February temperature at Cirrus Weather Solutions was 43.9 degrees with a maximum of 69.5 degrees on the 7th and a minimum of 20.8 degrees on the 1st. February precipitation measured 4.13" via the Cirrus automated gauge and 3.98" in a manual gauge used for the CoCoRaHS program. Freezing rain (0.01") was recorded on the 2nd and freezing rain and sleet of 0.04" was measured on the 20th-21st. The measured peak wind gust was 24 mph on the 18th. Average relative humidity was 72%. Click here for a daily recap on MemphisWeather.net. For the month of February, the average temperature error in all MWN temperature forecasts was 2.35 degrees, lower than all available full-range computer model data and just 0.03 of a degree behind the National Weather Service. More than 62% of the MWN temperature forecasts for the month were within 2 degrees of the actual temperature. MWN's forecasts extend out five periods (2.5 days, or roughly 60 hours). For dewpoint accuracy, the MWN forecast averaged 2.25 degrees error and fell within 2 degrees of the actual dewpoint over 66% of the time. Historical accuracy statistics can be found here.